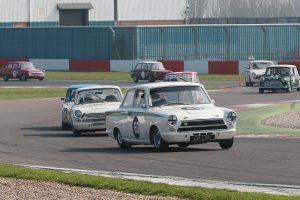 With a tremendous spirit in the paddock, superbly-presented cars, warm sunshine and first-class facilities at Donington Park, it was a fine way to open the HSCC’s 53rd season of racing. 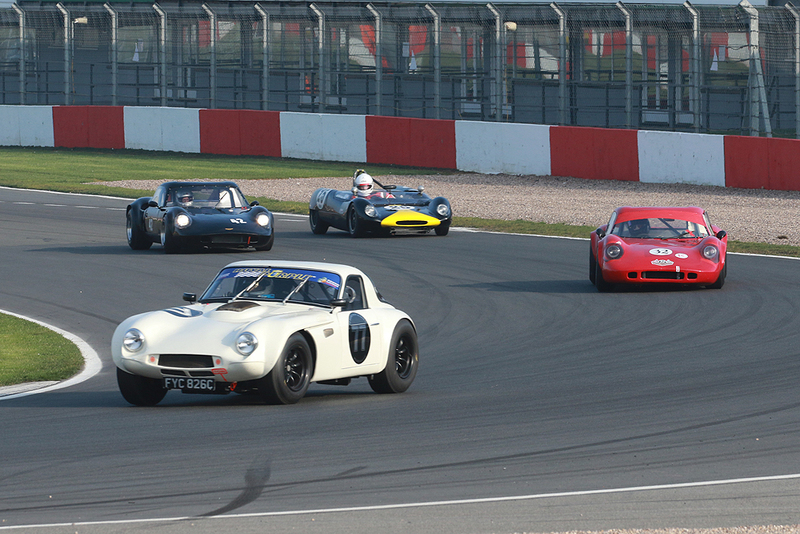 A thrilling finish to the Guards Trophy contest was one of the highlights of the day as Dan Cox and Mike Gardiner used their TVR Griffith to fend off a determined challenge from the leading sports-racing cars. Gardiner drove a strong opening stint, interrupted by a safety car period, before handing the V8 Griffith over to Cox. However, their advantage came under increasing attack over the closing minutes as the sports-racers hunted down the TVR. Charles Allison (Chevron B8) led the pursuit as Andrew Hibberd (Lotus 23B) and Mark Colman (Chevron B8) closed in as well. Allison made his big move with a lap to run and squeezed down the inside at the chicane. Cox saw the Chevron coming and gave it room before retaking the lead on the exit of the corner. Colman and Hibberd made it a four-car train into the final lap, but Cox rocketed the TVR down the main straight and got to the line a fifth of a second before Allison. However, the Chevron racer was later penalised 30s for stopping outside the pit window and so Mark and Hugh Colman took second from Michael and Andrew Hibberd. Adrian Langridge claimed his first Classic Formula 3 with father Andy’s March 803 but it was never easy and only came once a puncture sidelined early leader David Thorburn (Rat RT3). At the time, Langridge had been trying to find a way ahead but then had to watch his mirrors for the RT3 of the ever-present Paul Smith, who had to contend with a damaged front nose fin after a brush with a backmarker. “I was gifted that a bit,” said Langridge modestly after a strong return to the car. Nelson Rowe and Ben Stiles had an epic battle in the Classic FF2000 division, which Rowe narrowly won after a contest of the highest order. “That was great fun: firm but fair wheel-to-wheel awesome racing,” said Rowe. The Historic Road Sports opener, which concluded the programme in fine style, was a real barnstormer as the Morgan Plus 8s of Kevin Kivlochan and Tim Pearce battled mightily while Jonathan Rose tried to get his Lotus Elan in on the act. It all came down to an out-braking contest on the final lunge into the chicane and both missed the corner, but Kivlochan recovered first to grab victory. Pearce was also able to regain his composure and get to the flag shortly before Rose arrived in the Elan as guest racer John Williams (Porsche 911SC) completed the top four as Larry Kennedy (Elan) and Neil Merry (Sunbeam Tiger) packed the top six. 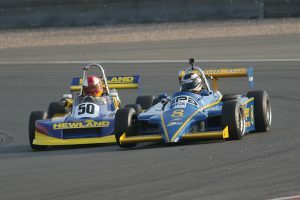 As might have been expected, defending champion Cameron Jackson took first blood in Historic FF1600 to give the Winkelmann marque a rare, if not unique, UK victory. However, this was no cruise as a mid-race safety car cost Jackson his margin and mis-marked gear ratios had left him with a long second rather than third, so it was a struggle. Speedsport’s Ben Tusting tigered clear of a mighty contest to go after Jackson, while his novice team mate Pierre Livingston claimed an impressive third despite being out-smarted by Jackson at the re-start. Andrew Park finished readying his Reynard SF81 late on Friday evening, so his pre-race test session was driving across the paddock to the assembly area. But that didn’t hinder his Historic Formula Ford 2000 progress towards a clear win, although his opening shot at a fourth title was made easier when a moment delayed Nelson Rowe and sent Ian Pearson to the pits with a bent nose fin. Rowe fought back to second despite a spirited defence by Jason Redding, and it took Rowe several laps to finally work up into second place. The absence of Charles Barter due to illness and Jeremy Clark after his Lotus Elan dumped its oil out in the assembly area rather left the 70s Road Sports race to John Dickson’s Ferrari 308 GTVB. However, given the pace of the Ferrari, the result would probably still have been the same. John Williams pressed on as hard as ever in his Porsche 911SC to take the runner-up slot and, in turn, was nicely clear of the battle for third between Adam Bagnall (Jaguar E-type) and Mark Bennett (MGB GT V8). Nordic raider Martin Strommen dominated the Historic Touring Car season opener on his first run in his ex-Soper Lotus Cortina. With Mark Watts (Ford Mustang) off into the McLeans gravel on the first lap and Richard Belcher (Lotus Cortina) cruising into the pits before mid-distance, Strommen was able to edge clear of an entertaining battle for second between Bob Bullen (Anglia) and Nick Stagg (Lotus Cortina). Sam Wilson only managed a handful of laps in qualifying for the opening Silverline Formula Junior UK Championship round before his Lotus 20/22 was sidelined by a broken wishbone. But with that fixed, he stormed to victory by just over half a minute as Adrian Russell (Lotus 22) and Steve Jones (Cooper T67) rounded out the podium.